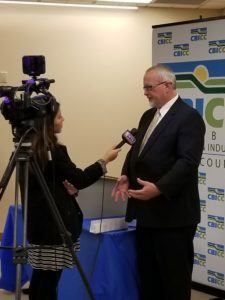 PennDOT Deputy Secretary for Highway Administration George McAuley said the process for the large-scale transportation project is “very long and very challenging.” He said the federal government’s involvement is “critical” to moving forward. Monday, Oct. 30, State College, PA – Members of the ‘Drive Forward’ Coalition and other transportation stakeholders recently joined with PennDOT officials to announce that efforts are underway to secure the necessary funding for a high-speed I-99/I-80 interchange at the Bellefonte Exit. PennDOT has submitted an application for federal discretionary funding through the U.S. Department of Transportation’s Infrastructure for Rebuilding America (INFRA) grant program. PennDOT is seeking $45 million. The total project cost – which also includes improvements to Jacksonville Road/Route 26, is approximately $200 million. If the grant is awarded, the construction of the high-speed interchange can move forward. Several Centre County organizations and businesses have written letters of support for the project, which were included with PennDOT’s application. Those support letters stressed the economic and safety importance of the interchange project to not only Centre County, but to central Pennsylvania. Federal government approval of the grant application is critical to this project becoming a reality. If INFRA grant funding is not approved, PennDOT will likely precede with necessary I-80 safety improvements, including bridge replacements. Once that hefty investment is made, there will be no desire any time soon to consider the interchange project. “Once those investments are made and safety improvements are made, certainly PennDOT and the taxpayers aren’t going to want to go back and rip that out in order to put in the full interchange,” stressed Centre County Metropolitan Planning Organization Chairman Jeff Luck. Federal officials need to know that this project is important to Centre County and central Pennsylvania. Drive Forward will convey this message over the coming months, as the U.S. Department of Transportation considers PennDOT’s application. Help us send a strong message to federal officials that this project needs to move forward. Sign on as a supporter today!